Last week, I was very fortunate to travel to Maine with a friend who is an excellent writer. Coming from different perspectives, our conversations were very engaging throughout long hours in a car and pelting rain 5 out of the 7 days! Our goal was to explore this vast state by sea, land and air. We took cruises showing us whales and puffins. Pete Salmansohn and Stephen Kress are with the National Audubon Society, working very hard to support seabird conservation and research. Members live on Eastern Egg Rock, a very isolated island off the coast of Maine, with no “comforts of home”. By day, they spend their time in small observation boxes monitoring the wildlife. Sleeping in tents at night can be difficult to say the least with the rainy weather and the ceaseless cacophony from the birds. I was so impressed with their dedication. Visit www.projectpuffin.org in order to learn more. Our next venture took us to Acadia National Park where the tallest mountain on the U.S. Atlantic coast can be found. From the top of Cadillac Mountain we looked out onto amazing vistas (even in the rain) and there is easy access by car. There are over 120 miles of hiking trails and a car loop for those who would rather travel with more protection from the rain! 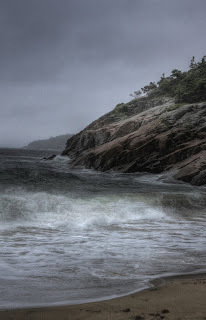 Here you can see the quintessential views of Maine…the rugged coastline with the crashing waves. It was truly awesome. http://www.nps.gov/acad/index.htm. Last but not least, be sure to go up in a piper airplane with the guys at the Maine Coastal Flight Center, www.mainecoastalflight.com . They will take you over Cadillac Mountain or show you the famous lighthouses of Maine. They have several trips to engage you above the clouds and will provide you with the “inside information” of the sights! 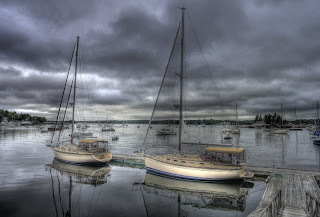 Rain or shine, Maine was a wonderful spot to visit!